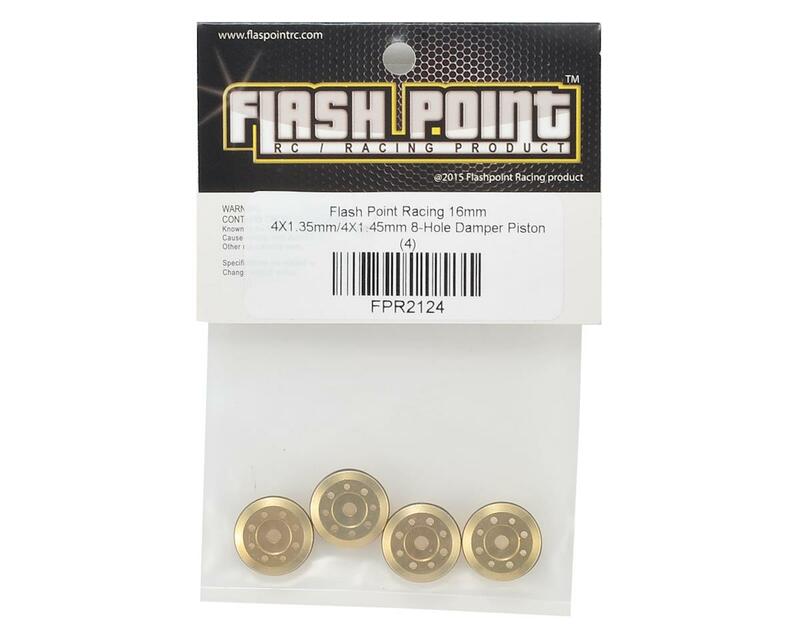 Flash Point Racing 16mm Brass Damper Piston. These dual 4x1.15/4x1.35 8 hole pistons are unique in that they are machined from brass to slow down the piston speed and help to make the car easier to drive and more consistent. The 8 hole pistons are recommended for bumpy high grip surfaces. These pistons can be used in any vehicle that uses a 16mm shock, but the 2.6mm center hole for the shock shaft may need to be reamed out to fit some applications. NOTE: Hot Bodies and Losi vehicles require that the user ream out 2.6mm center hole to fit the shock shaft. I got these due to an even mix of; marketing, beer and curiosity. The basic goal of the pistons is to slow shaft speed and provide plush ride etc, see video for more on that. This is done by adding mass (brass). A universally accepted rule in Motorsport from Formula 1 down is less unsprung weight is better than more unsprung weight. This rule has no exceptions hence lightweight hubs, wheels and tires etc. Use of expensive and exotic lightweight materials such as carbon fibre, titanium and magnesium alloys. 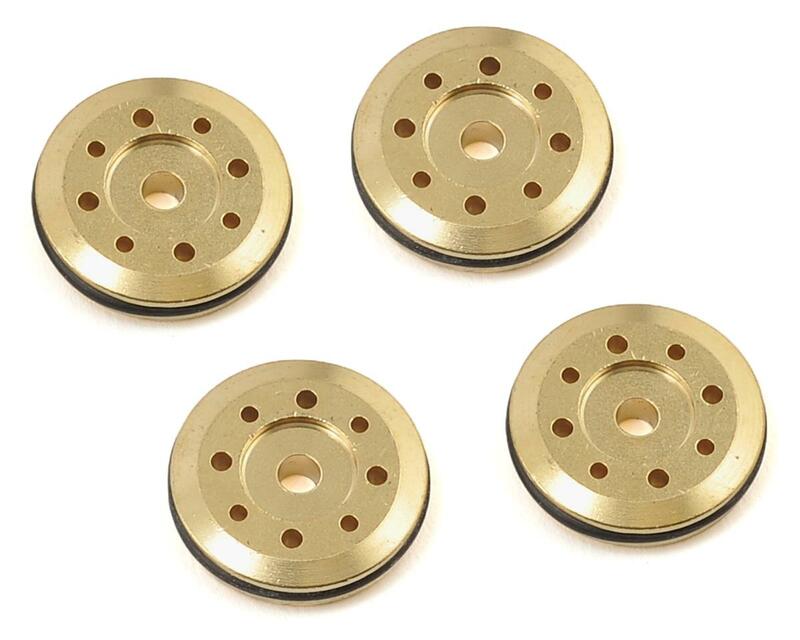 These brass pistons weigh about 17grams in total as opposed to 2 grams for the equivalent plastic pistons. Clear win here to plastic based on the law of unsprung weight in Motorsport. The shocks I use is a precise 16.00mm inner diameter. The brass is very well machined at a consistent 15.65mm. The plastic piston I used to compare is also consistent but much closer at 15.87mm. The brass therefore has far more slop. To counter this slop a rubber o ring is introduced. Its dimensions are more difficult to measure because it’s loose, ill-fitting, and easily compresses into the brass channel which keeps it in place. Zoom in on the photo of the pistons above and you almost get a picture of what I mean. The problems, as I’ve experienced, is the piston can still have slop but may also be a snug fit. I don’t know whether the rubber is swelling from the shock oil or just poor consistency with o ring dimensions but two of the pistons I installed were snug. A snug fitting rubber o ring has a far greater friction coefficient than plastic and therefore imparts its own resistance to movement. I’d gone as low as 250CST before giving up trying to get some life out of the shock - usually I’d use 550-600CST. This issue is made worse as friction means heat and wear. I didn’t dare have them in long enough as the idea of a worn o ring which then exposes the hard brass to my shock body / coating wasn’t worth the risk. If maifield does use these, I would imagine he’d either be replacing the o rings every race or the whole piston. For me that’s another easy win to plastic, more so, if I add the risk of the brass piston knocking around and grinding shock bodies. So my advice for achieving slow shaft speed and a plush Rolls Royce type of ride is this: stick with plastic and use thicker oil. 14 of 17 customers found this review helpful.